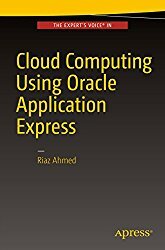 Develop cloud-based applications rapidly using the Oracle Application Express (APEX) platform. You will learn to develop a comprehensive functional business application which can be deployed in your organization. Cloud Computing Using Oracle Application Express will teach you how to develop a complete general ledger accounting system which will be accessible through a variety of devices, including desktops, laptops, and the latest smartphones.What You Will Learn:Use new Oracle APEX 5.0 techniquesDevelop a complete general ledger accounting system named The Cloud Accountant Create cloud-based business apps accessible anywhere and anytimeEnhance your APEX development skillsWho This Book Is For:Web developers who possess some working knowledge of Oracle Application Express, and developers who have been using Oracle Forms and now wish to use their existing SQL and PL/SQL expertise.